﻿﻿﻿﻿﻿ Ryan Winchester is a stud. The 12 year-old seventh grader from Powell, Tennessee has accomplished a feat that few adults can claim. He has now taken a deer with a bow. 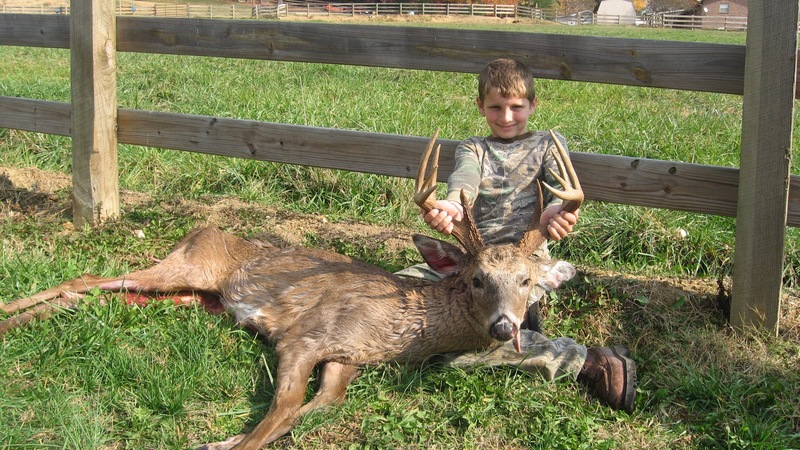 In fact, the photo above of him and his bow kill was the first one posted on TnDeer.com's popular kill picture thread for the 2010 season. Ryan's path to bowhunting success has been carefully guided by his dad Scott. Scott is an avid deer hunter and diehard proponent of hunting dominant trees (which he calls "killing trees"). Ryan is learning to identify trees and read deer sign, so he and Scott spent lots of time scouting in the pre-season. It's no accident then that he was hunting a hot chestnut oak on the opening morning of the 2010 archery season. It's also no accident that Ryan made a perfect shot when the time came. He worked hard shooting his left-handed bow three times a week in the months leading up to deer season. Due to the difficulty of finding a proper fitting left-handed youth bow, his dad had to modify one that started out with a draw length that was too long and a draw weight that was too heavy. If you look closely at the photo below, you will notice that the limb pockets have been modified to achieve the proper draw length and a 38 pound draw weight. Pretty ingenious! The story of Ryan's hunt begins on the Wednesday prior to the opening of Tennessee's archery season when Ryan and Scott discovered a chestnut oak with lots of feeding sign underneath. The tree was on a very small plot of private land that most hunters would overlook, thinking it to be too small to possibly hold deer. Fortunately, they put their trust in the sign that they saw and they hung two lock-on stands on trees that were about twenty yards apart. Although some hunters claim that deer will not eat chestnut oak acorns, Scott knew that in the early weeks of bow season, before other, more desireable species of acorn drop, deer will gobble them up. Opening morning found Ryan, Scott, and Scott's dad waiting out the rain that had moved in overnight. Ryan and Scott arrived at their stands right at daylight, just as the rain was easing up. They had only been in the stand for about fifteen minutes when Ryan motioned to his dad that there were two deer approaching. Ryan maintained his composure for the ten minutes or so that it took the deer to make their way to the dominant tree they were set up on. Ryan knew that he would have to wait for the deer to get within 25 yards to ensure a clean kill with his light archery tackle. Because he was hunting a dominant tree, he knew exactly where the deer was headed and he knew that he was set up in a location to get that close shot. It was just a matter of time. 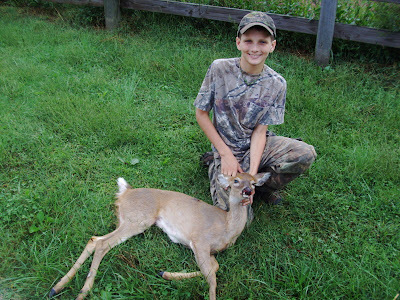 As the deer began to feed Ryan waited patiently to draw his bow when the deer's head passed behind a tree. He made a perfect shot and watched happily, but carefully, as the deer ran off. In a few minutes Ryan and Scott climbed down and Ryan walked directly to the spot he had mentally marked to find his arrow covered in bright red blood. Ryan led the tracking job, finding the deer piled up a mere 50 yards away with a perfectly placed hole through both lungs. He then took care of the field dressing and dragging chores on his own. Needless to say, grandfather, father, and son were all thrilled to death and very proud of what Ryan had accomplished. Although Ryan has killed larger deer, including this impressive buck taken during the 2007 firearm season, his first bow-killed deer will certainly rank among the most memorable of his life. In this day of quick fixes and instant gratification, it's truly wonderful to see a young man accept the challenge of learning the skills of a woodsman and practicing his craft so that when the moment of opportunity presents itself he is ready. He can now proudly wear the title of bowhunter. Kudos to Scott for passing along the skills and values that will serve Ryan well in the years to come. We should all be so lucky to have a mentor like Ryan does. Oh, did I mention that Ryan Winchester is a stud? Way to go dude! Congrats to Ryan on a great animal! man he's a better hunter than me! 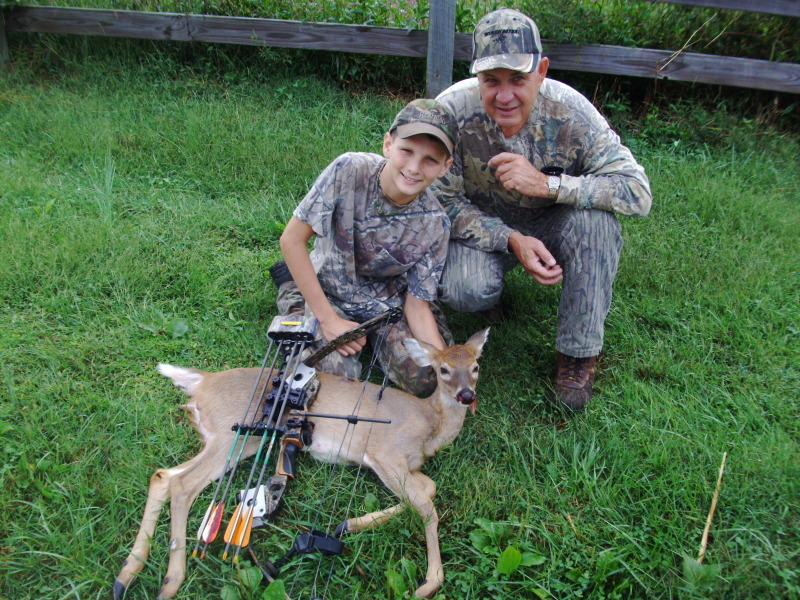 This short article posted only at the web site is truly good.I'm also visiting this site regularly, this web site is really nice and the users are genuinely sharing good thoughts about bow-hunting and its advantages from the hunting site.